After performing the most spiritual ibadah “Hajj“, Muslims celebrate “Eid ul Azha“. This festival is also known as “Sacrifice Feast“. Some people called it as “Greater Eid“, the second most important Muslims’ festival celebrated around the world. On this celebratory occasion Muslims sacrifice goats, sheep, cows, camels or lamps in the name of Allah. It’s a time of family reunion. Muslims hug each other three times after offering Eid prayer. They wish each other, send greetings or messages. What if you send funny messages or greetings to your loved ones? This act can bring a huge smile on their faces and reason would be definitely you. You can get Allah’s reward if make someone smiles. So don’t miss this reward, download the funny images I’m sharing and share your friends/relatives. 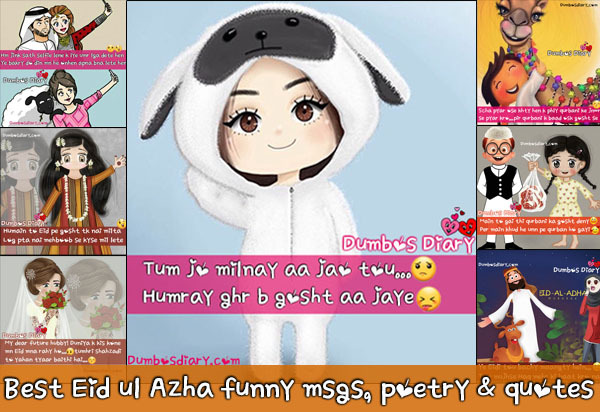 Here’re best Eid ul Azha funny Messages, Poetry, Quotes in Urdu/Hindi. My dear future hubby! Duniya ke kis kone mein Eid mana rahy ho? Tumhari shahzadi tou yahan tyaar baithi hai. Sacha pyaar ose kehty hain keh pehlay qurbani ke janwer se pyaar kro…. Phir qurbani ke baad os ke gosht se. Or phir kuch larkiya’n aysi hoti hain jo “Bakra Eid” ke din bhi egg, bread kha rahi hoti hain. “Bakra Eid” pe ghar waly gosht tou ayse pkwaty hain jaise k saray barati ka khana humaray ghar pe he hai. Eid tou hum larkiyo’n ki hoti hai…yeh larky tou bss qassai ka kaam sambhalny or gosht baantny ke liye hotay hain.